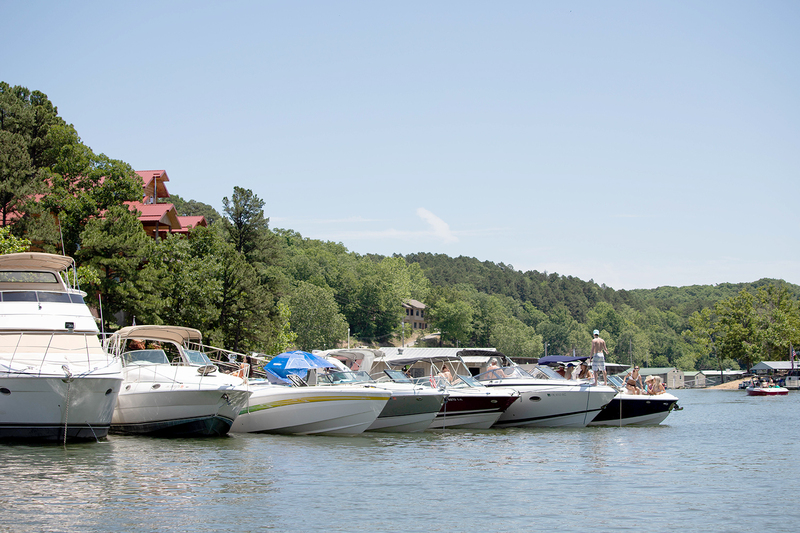 Lining up for lake time … The July 4th holiday is one the busiest boating times on GRDA’s Grand and Hudson lakes, and the Illinois River. If your holiday plans include a trip to any of these waters, the GRDA Police Department urges you to boat safe, smart and sober. Langley – On the waters of Grand and Hudson lakes, as well as the Illinois River, the July 4th holiday is often the high point of the summer season. 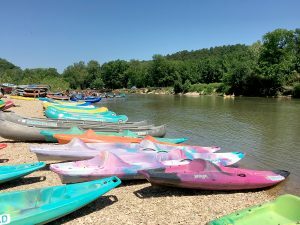 In anticipation of all the water enthusiasts paying a visit to enjoy Oklahoma’s premier recreation destinations, the Grand River Dam Authority Police Department wants to remind each of them to boat and float safe, smart and sober. 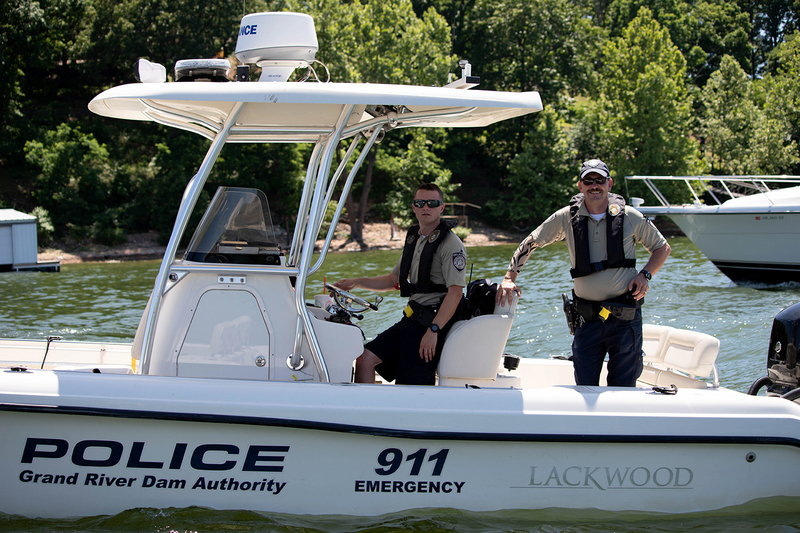 Promoting safe outings… The GRDA Police Department will be out in full force over the July 4 holiday, to help promote safe outings and assist boaters. If you have an emergency on the water, dial 911. You can also reach the police on Marine Band 16.
special boating rules are in effect for the Duck Creek arm of the lake. On the actual day of the Duck Creek Fireworks (Wednesday, July 4) all watercraft shall operate at “Idle” and avoid producing a wake at all times in Duck Creek (all day, all night). However, whether your plans are to watch the Duck Creek fireworks or any other lake-area fireworks display from the water, the following tips can help promote a safe and enjoyable holiday outing. Before you leave the dock, know the stability, load capability and handling of the vessel you are operating. Remember, every boat is different. Check the water conditions and know where hazards like sandbars and stump beds are located. Floating the scenic Illinois River? GRDA reminds you to let the commercial float operator know if you or anyone in your party are a first-time or novice floater(s). They may be able to pair you with an experienced paddler/floater or float you in a raft where there is a lesser chance for capsizing. If you are tired while floating, take a break on the bank or on a gravel bar to rest. Never swim or boat alone. Stay within sight of companions. Floating on the Fourth … Canoes and kayaks lined up and ready to take floaters down the scenic Illinois River. If your holiday plans include a float trip, the GRDA Police Department is passing along some safety tips you should keep in mind. GRDA also reminds you that the July 4th holiday is a great chance to take a free tour of historic Pensacola Dam. Tours originate from the GRDA Ecosystems and Education Center, located just west of the dam, in Langley. If you are planning on taking the tour, remember to wear comfortable shoes (there is a fair amount of walking involved) and dress for the weather. Also, all persons over 18 are required to present some form of ID. Tours are available seven days a week (9AM to 4PM). For more information about the GRDA Police Department or how an officer can assist you, contact the department at (918) 256-0911 or visit grda.com. 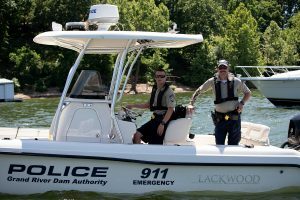 Finally, if you need assistance from your boat, the GRDA Police Department encourages you to call 911. If you do not have a cell phone available, you can radio the GRDA Police on Marine Band 16.